How could chiropractic eliminate the hurdles which are keeping you from achieving your running goals? Then you have probably had an injury at some time during your running career. The five most common running injuries are: Achilles tendonitis, chondromalacia, iliotibial band (ITB) syndrome, plantar fasciitis and shin splints. Achilles tendonitis is a painful and often debilitating inflammation of the Achilles tendon. The Achilles tendon is the largest and strongest tendon in the body. It is located in the back of the lower leg, attaches to the heel bone, and connects the leg muscles to the foot. The Achilles tendon gives us the ability to rise up on our toes, facilitating the act of walking. Achilles tendonitis is more common in athletes. Plantar fasciitis, which may cause the heel to hurt, feel hot or swell, is inflammation of the plantar fascia, a thin layer of tough tissue supporting the arch of the foot. Repeated microscopic tears of the plantar fascia cause pain. Sometimes plantar fasciitis is called “heel spurs”, but this is not always accurate, since bony growths on the heel may or may not be a factor. Typically with plantar fasciitis, the pain is worse when first getting out of bed, or is noticeable at the beginning of an activity and gets better as the body warms up. 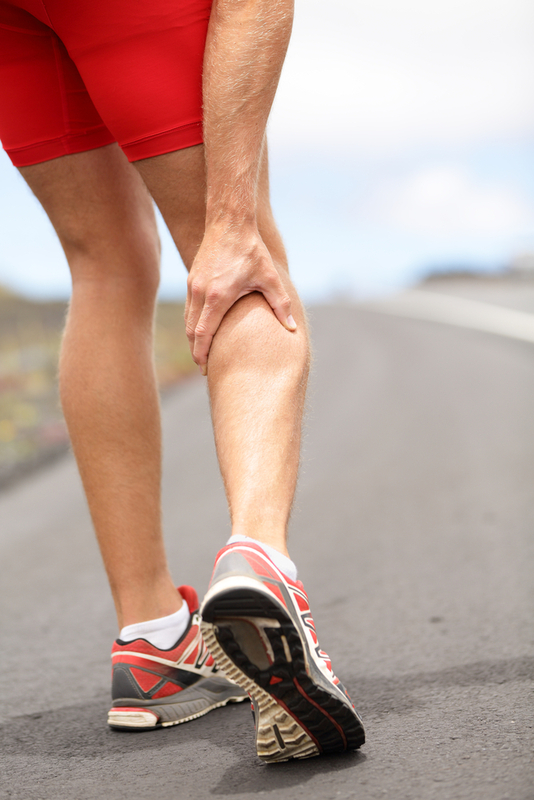 The term shin splints refer to a painful condition that develops along the inside of the shin (tibia). The usual location is along the lower half of the tibia, anywhere from a few inches above the ankle to about half-way up the shin. The repeated running cycle of pounding and push off results in muscle fatigue, which may then lead to higher forces being applied to the fascia, the attachment of fascia to bone, and finally the bone itself. If this happens, a stress fracture may occur. Stretching and strengthening the calf muscles can help prevent the injury from returning.